For all the criticism leveled against Washington, its role is indispensable – at least for now. As the United States hosted the 7th Clean Energy Ministerial in San Francisco on June 1-2, the Obama administration sought to demonstrate global leadership on green energy and climate change. Those efforts, however, are being undercut by GOP presidential nominee Donald Trump and Republicans in Congress. Just a few days before the meetings began, Trump promised to cancel the COP21 climate accords and embrace both coal energy and the Keystone XL pipeline if he wins the election. With the European Union in disarray and China and India prioritizing economic growth over environmental concerns, U.S. leadership remains critical for the agreement’s success. If Washington fails to fulfill its obligations, the deal could fall apart—even as global temperatures rise and the devastating effects of climate change become ever more apparent. In condemning such accords, opponents like Trump often cite insufficient action by China and India. Though the two countries are regularly scrutinized for not doing enough to cut greenhouse gas emissions and for their heavy reliance on coal to spur development, the United States is to blame as well. As the world’s second-largest polluter and second-highest per capita emitter (significantly higher than either India or China), the United States is ultimately just as much of a wildcard in climate change efforts. While President Obama has made historic commitments to reduce greenhouse gas emissions within the COP21 framework, it was not without political obstacles. The agreement faced stiff opposition in Congress, as has long been the case with climate accords. 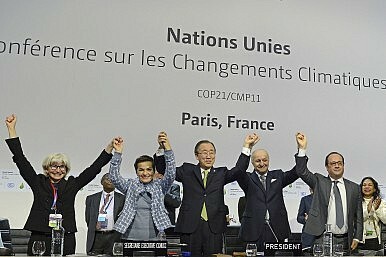 Having learned the lessons of past failed agreements, COP21 was made non-binding (in part to circumvent the need for Congressional ratification). Even so, a future president could just as easily undo the agreement, and that appears to be Donald Trump’s intention. This has already happened once: President George W. Bush reversed Bill Clinton’s decision to include the United States in the Kyoto Protocol. European, Chinese, and Indian diplomats are already worried that an American decision to renege on the COP21 would fatally undermine the agreement. Such an outcome would be a tremendous embarrassment for the United States and a significant step backward from its position of global leadership. For all the obstacles faced in Washington, there is no other diplomatic workhorse willing to put its full weight behind the grinding work of a multilateral energy shift. The only recently changed attitudes of China and India toward climate change efforts illustrate this point. As the world’s first and fourth largest polluters respectively, and with emission volumes projected to increase significantly further, Chinese and Indian buy-in is essential. In place of cooperation, however, their actions on curtailing emissions have been inadequate and at times downright obstructive. The two countries jointly brought 2009’s COP15 to a halt: during the talks, China refused to accept proposed emissions targets and India rejected emissions reductions it had itself proposed. The two countries ultimately brokered their own agreement with South Africa and Brazil. China’s lingering reticence on climate issues is evident in other instances as well. The environmental safeguards put forward by its Asian Investment Infrastructure Bank (AIIB) were criticized for their rushed consultations and limited scope, seen as particularly meager for a $100 billion institution. It is still too early to know how seriously the AIIB will take implementing world-class standards, but critics worry the shortcomings in the bank’s environmental framework leave ample room for subjective interpretation. Ultimately, both China and India are primarily concerned with sustaining economic growth and will use cheap, dirty energy like coal if it offers them the best avenue to do that. As such, they are unwilling to accept more drastic emissions cuts for fear of harming to their economies. Despite India and China’s derelictions, there are still some notable examples of leadership outside the core of developed nations. The Alliance of Small Island States (AOSIS), for example, played a major role at COP21. With rising sea levels threatening to swallow entire islands, AOSIS has been among the most vocal advocates for action on climate change. Even oil-producing states such as Kazakhstan have become vocal leaders in the fight against climate change, with president Nursultan Nazarbayev renewing calls at the recent Astana Economic Forum for the development of a green economy road map based on the COP 21. The Kazakh capital will host the green energy-focused Astana Expo 2017 next year, emphasizing energy efficiency technologies, smart cities, and renewable energies, thereby marking a strikingly bold tone from other former Soviet republics. More immediately impacted by the effects of climate change, vulnerable countries like Bangladesh added much political impetus to COP21 as well. Even the likelihood of danger, however, does not always suffice to compel nations to act. The Philippines is a case in point. Despite the threat of rising sea levels to the over 7,000 islands that make up the country, Manila is still pushing ahead with coal plants to meet its drastic energy needs. Ultimately, the limited clout these countries enjoy and their relatively small share of global emissions inhibits their ability to influence global environmental action. With Europe preoccupied, China and India conflicted, and other developing nations lacking influence, the United States is still the only nation positioned to lead the world in its efforts to combat climate change. The COP21 agreement is not without problems, but it also offers much hope. Only with faithful implementation in Washington will Beijing and New Delhi keep pace in tightening their emissions targets. For this to happen, U.S. policymakers must resist the distrust of the outside world seemingly embraced by a skeptical American public. If a President Donald Trump were to follow through on his pledges to throw out American climate commitments, he could doom the international community’s joint efforts less than a year after the agreement was signed in New York. Anthony Kleven is an economic risk consultant based in Singapore. The views expressed here are his own.